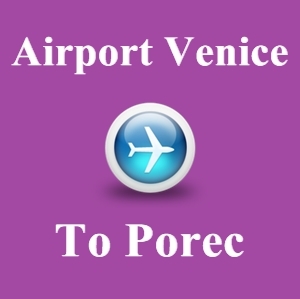 The Venice airport – Marco Polo, Is situated 230 km from Porec, the second Venice airport in Treviso is situated 240 km from Porec, in both cases there is an estimated travel time with car of about 2.5 hours. From both airports there is a frequent airport bus, to the Mestre Railway station in Venice, travel time from Marco Polo airport is 20-30 minutes, from the airport in Treviso about 1 hour. From the Mestre Railway station, there is train connection to Trieste and a large number of other cities in Italy. Below we have listed the various travel options you have from either of the Venice Airport(s) to Porec. By Car, as mentioned the a car drive from the Venice airport to Porec takes about 2.5 hours, expect for 15-20 km of road in Slovenia, there is highway end to end. On the highway in Italy and Croatia, toll fee applies. At the Venice airport you can rent a car most of the international car rental brands, normally it is not a problem to bring the car into Croatia, but make sure to ask anyway. You can check the current car rental offers available from the Venice airport here. Transfer, for a few people a transfer is obviously a relative expensive way of travelling from the Venice airport to Porec, but if you are a group of more people a pre-booked transfer is for sure a travel option to consider. Here you can check prices and pre-book a transfer from the Marco Polo airport, and here you can see prices and pre-book a transfer from the Treviso airport. Bus, currently there is unfortunately NO bus from Venice with a scheduled stop in Porec, there is although a two daily bus to Pula (except Sundays) to Pula, which could be used to travel Venice – Pula, Pula – Porec. Timetable for the buses you can find here. To catch either of the buses in Venice, you will have to take the airport bus from either of the airports (Marco Polo, Treviso Airport) to Venice. Alternative way of travelling by bus could be Venice – Triest, Trieste – Porec. Train, from the Mestre railway station there are frequent trains to Trieste, from Trieste you will then have to continue the travel, with either bus, rented car, pre-booked transfer or with the Trieste – Porec boat line (Operates only during summer season). Boat / Catamaran, venezialines operates a catamaran between Venice and Porec. During main season (July and August) the catamaran has departure almost every day, outside of main season (April- June + September-October) there is 2-4 weekly departures. Feel free to leave a comment below if you have any questions about travelling from the one of the Venice airports to Porec.